During his tenure, U.S. President James K. Polk oversaw the greatest territorial expansion of the United States to date. Polk accomplished this through the annexation of Texas in 1845, the negotiation of the Oregon Treaty with Great Britain in 1846, and the conclusion of the Mexican-American War in 1848, which ended with the signing and ratification of the Treaty of Guadalupe-Hidalgo in 1848. These events brought within the control of the United States the future states of Texas, California, Nevada, New Mexico, Arizona, Utah, Washington, and Oregon, as well as portions of what would later become Oklahoma, Colorado, Kansas, Wyoming, and Montana. Following Texas' successful war of independence against Mexico in 1836, President Martin van Buren refrained from annexing Texas after the Mexicans threatened war. 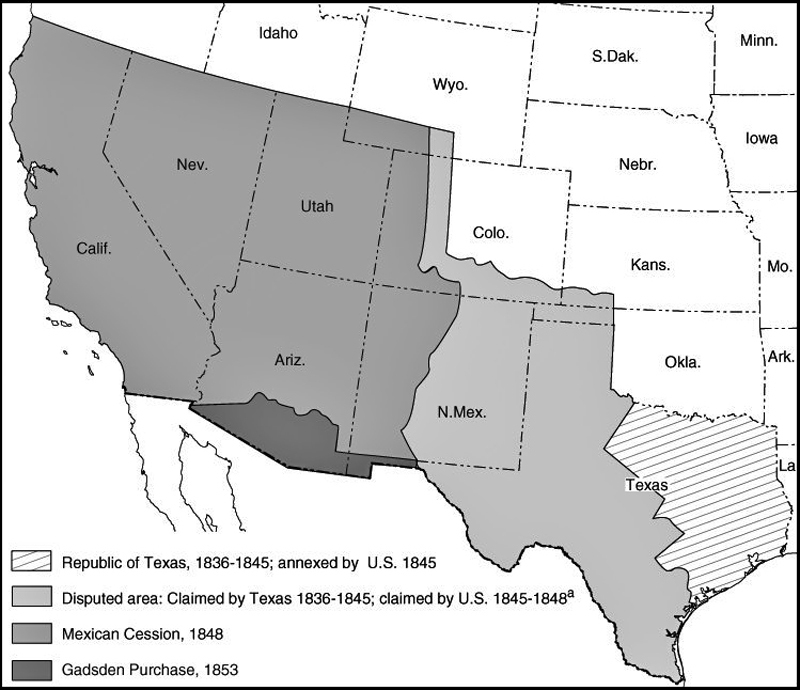 Accordingly, while the United States extended diplomatic recognition to Texas, it took no further action concerning annexation until 1844, when President John Tyler restarted negotiations with the Republic of Texas. His efforts culminated on April 12 in a Treaty of Annexation, an event that caused Mexico to sever diplomatic relations with United States. Tyler, however, lacked the votes in the Senate to ratify the treaty, and it was defeated by a wide margin in June. Shortly before he left office, Tyler tried again, this time through a joint resolution of both houses of Congress. With the support of President-elect Polk, Tyler managed to get the joint resolution passed on March 1, 1845, and Texas was admitted into the United States on December 29. While Mexico did not follow through with its threat to declare war if the United States annexed Texas, relations between the two nations remained tense due to Mexico's disputed border with Texas. According to the Texans, their state included significant portions of what is today New Mexico and Colorado, and the western and southern portions of Texas itself, which they claimed extended to the Rio Grande River. The Mexicans, however, argued that the border only extended to the Nueces River, several miles to the north of the Rio Grande. In July, 1845, Polk, who had been elected on a platform of expansionism, ordered the commander of the U.S. Army in Texas, Zachary Taylor, to move his forces into the disputed lands that lay between the Nueces and Rio Grande rivers. In November, Polk dispatched Congressman John Slidell to Mexico with instructions to negotiate the purchase of the disputed areas along the Texas-Mexican border, and the territory comprising the present-day states of New Mexico and California. Following the failure of Slidell's mission in May 1846, Polk used news of skirmishes between Mexican troops and Taylor's army to gain Congressional support for a declaration of war against Mexico. The President neglected to inform Congress, however, that the Mexicans had used force only after Taylor's troops had positioned themselves on the banks of the Rio Grande River, which was effectively Mexican territory. On May 13, 1846, the United States declared war on Mexico. Following the capture of Mexico City in September 1847, Nicholas Trist, chief clerk of the Department of State and Polk's peace emissary, began negotiations for a peace treaty with the Mexican Government under terms similar to those pursued by Slidell the previous year. Polk soon grew concerned by Trist's conduct, however, believing that he would not press for strong enough terms from the Mexicans, and because Trist became a close friend of General Winfield Scott, a Whig who was thought to be a strong contender for his party's presidential nomination for the 1848 election. Furthermore, the war had encouraged expansionist Democrats to call for a complete annexation of Mexico. Polk recalled Trist in October. Believing that he was on the cusp of an agreement with the Mexicans, Trist ignored the recall order and presented Polk with the Treaty of Guadalupe-Hidalgo, which was signed in Mexico City on February 2, 1848. Under the terms of the treaty, Mexico ceded to the United States approximately 525,000 square miles (55 percent of its prewar territory) in exchange for a $15 million lump sum payment, and the assumption by the U.S. Government of up to $3.25 million worth of debts owed by Mexico to U.S. citizens. While Polk would have preferred a more extensive annexation of Mexican territory, he realized that prolonging the war would have disastrous political consequences and decided to submit the treaty to the Senate for ratification. Although there was substantial opposition to the treaty within the Senate, on March 10, 1848, it passed by a razor-thin margin of 38 to 14. The war had another significant outcome. On August 8, 1846, Congressman David Wilmot introduced a rider to an appropriations bill that stipulated that "neither slavery nor involuntary servitude shall ever exist" in any territory acquired by the United States in the war against Mexico. While Southern senators managed to block adoption of the so-called "Wilmot Proviso," it nonetheless provoked a political firestorm. The question of whether slavery could expand throughout the United States continue to fester until the defeat of the Confederacy in 1865. The Gadsden Purchase, or Treaty, was an agreement between the United States and Mexico, finalized in 1854, in which the United States agreed to pay Mexico $10 million for a 29,670 square mile portion of Mexico that later became part of Arizona and New Mexico. Gadsden's Purchase provided the land necessary for a southern transcontinental railroad and attempted to resolve conflicts that lingered after the Mexican-American War. These continuing tensions between Mexico and the United States complicated U.S. efforts to find a southern route for a transcontinental railroad as the only viable routes passed through Mexican territory. In 1847, the United States attempted to buy the Isthmus of Tehuantepec, an isthmus on the southern edge of North America, as an alternative means of providing a southern connection between the Atlantic and Pacific oceans. Mexico, however, had already granted Mexican Don José de Garay the right to build colonies for Americans on the isthmus with capital from the New Orleans Company. Fearing the colonists would rebel as those in Texas had, Mexican President Juan Ceballos revoked the grant, angering U.S. investors. In 1853, Mexican officials evicted Americans from their property in the disputed Mesilla Valley. When the U.S. Government did not act, Governor William Lane of New Mexico declared the Mesilla Valley part of the U.S. territory of New Mexico. Mexican President Antonio de Santa Anna responded by sending troops into the valley. Attempting to diffuse the situation, U.S. President Franklin Pierce sent James Gadsden, the new U.S. Minister to Mexico, to negotiate with Santa Anna. Secretary of State William Marcy instructed Gadsden to renegotiate a border that provided a route for a southern railroad, arrange for a release of U.S. financial obligations for Native American attacks, and settle the monetary claims between the countries related to the Garay project. Gadsden met with Santa Anna on September 25, 1853. President Pierce sent verbal instructions for Gadsden through Christopher Ward, an agent for U.S. investors in the Garay project, giving Gadsden negotiating options ranging from $50 million for lower California and a large portion of northern Mexico to $15 million for a smaller land deal that would still provide for a southern railroad. Ward also lied to Gadsden, stating the President wanted the claims of the Garay party addressed in any treaty concluded with the Mexican Government; however, President Pierce never gave Ward these instructions because he did not believe in government involvement in affairs between private companies and foreign governments. Santa Anna refused to sell a large portion of Mexico, but he needed money to fund an army to put down ongoing rebellions, so on December 30, 1853 he and Gadsden signed a treaty stipulating that the United States would pay $15 million for 45,000 square miles south of the New Mexico territory and assume private American claims, including those related to the Garay deal. The United States Government agreed to work toward preventing American raids along Mexico's border and Mexico voided U.S. responsibility for Native American attacks. After Gadsden's Purchase a new border dispute caused tension over the United States' payment, and the treaty failed to resolve the issues surrounding financial claims and border attacks. However, it did create the southern border of the present-day United States, despite the beliefs of the vast majority of policymakers at the time who thought the United States would eventually expand further into Mexico. LW2577: 19200 dpi jpeg from smaller jpeg | Online image only.